A very rare opportunity happened this last weekend. 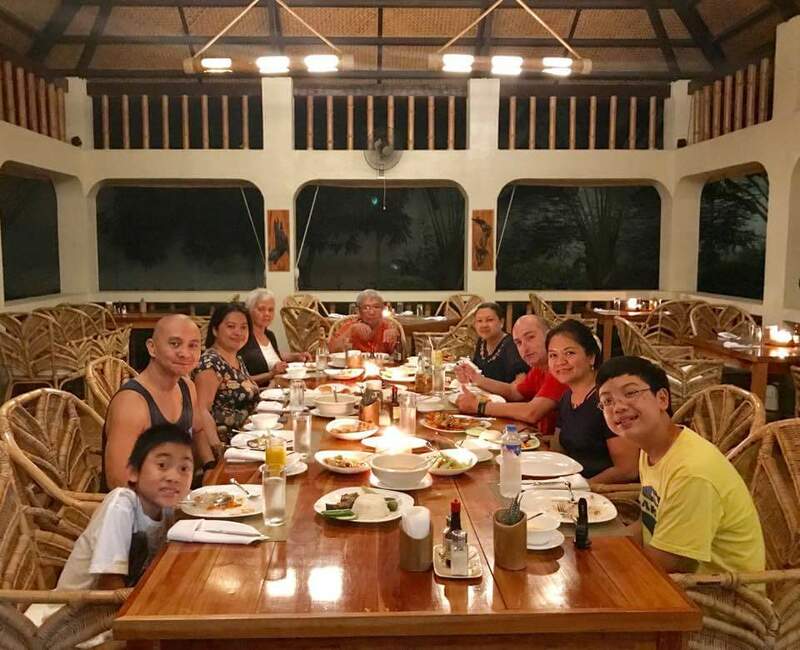 Thanks to family coming from San Francisco, our party of nine once again reunited in Palawan for a weekend experience that would likely remain in our memories forever. It was three days of ups and downs, of uncertain weather, of adventures we didn’t know what to expect but ended enjoying it nevertheless. Day one. The three of us– wifey, Marcus, and I–arrived ahead of everyone in Puerto Princesa and were picked up by Munting Paraiso‘s shuttle for an early check in. We stayed in room number nine and sis and family would take eight. My mother, father, and elder sister stayed somewhere nearby, Paboreal, where we all converged for lunch before our first Palawan vacation activity. Clockwise from lower right: Paboreal’ room is big; Beer is life; Meeting my mother again after 3 years; At the crocodile farm; Croc stuffed toy. 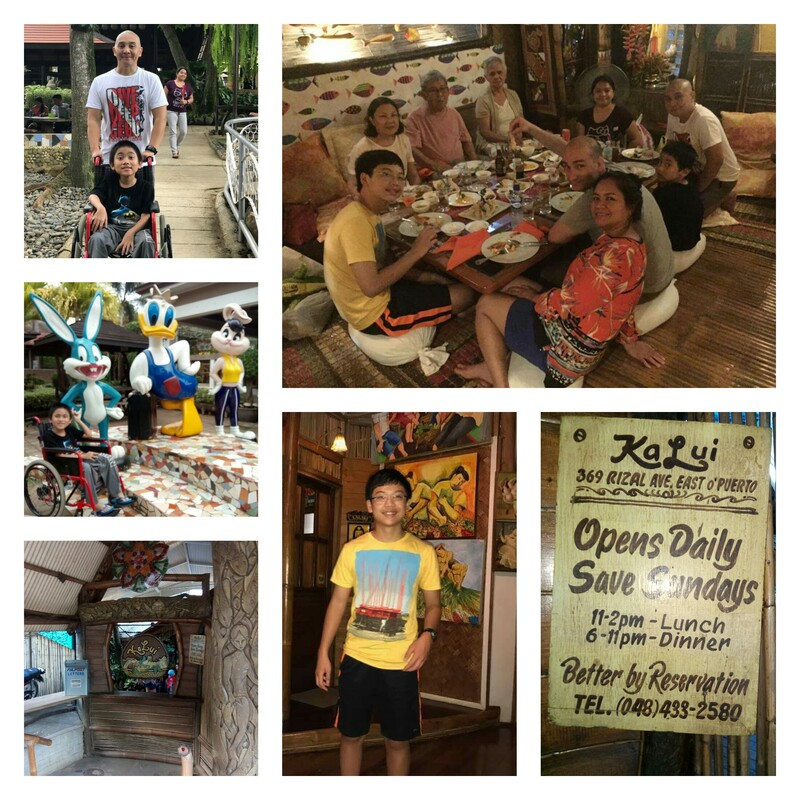 Clockwise from middle left: Baker’s Hill has stuff for kids; Other than its hopia, the place itself is an attraction; Dinner at Kahlui; Get reserved please; Mini gallery; Kahlui’s entrance. Friday afternoon was spent on a subtle city tour. It was our first feel of the dizzying Puerto Princesa City’s streets. We passed by their baywalk, the crocodile and Mitra farms, Baker’s Hill, and a souvenir market. All these getting in and out of the van plus the unusually humid weather worked up our appetite for dinner. Our elder sister who previously visited Puerto Princesa reserved accommodation for us in one of the city’s popular resto called KaLui but since the place sticks to its 6 PM opening so we waited for an hour in their garden. It felt like an eternity. Good thing that the long wait was worth it. KaLui is a Filipino-themed restaurant. Its structure, wooden furnitures, menu, and yes, its observance of an old-fashioned practice of removing footwear upon stepping inside the place made us feel like visiting a home rather than a commercial establishment. Our low-seating arrangement complemented the native dining experience. KaLui has interesting artifacts and even has a mini art gallery, and a restroom so clean that walking in barefoot didn’t matter. Too bad I didn’t return to take a picture of the restroom as I got busy tasting everything that was served on our table. Its local brew was nice as well but I soon learned it was pricey than San Miguel. The sky opened up early Saturday morning and it felt like nothing could be accomplished that day. We all left for the Underground River tour anyway in spite of heavy downpour but without wifey and Marcus. Good thing our tour guide kept the rainy drive interesting for everyone including our foreign guests as he speaks good English and provides insights about the place. We reached the port after about an hour and 30 minutes. Weather improved when we reached the ferry port. Only challenge left was to have our 82-year old father get on the ferry and deal with some slight bumpy ferry trip to the Underground River. All efforts paid off when we started getting a glimpse of the rock formations along the coastline. The main attraction would be more striking. 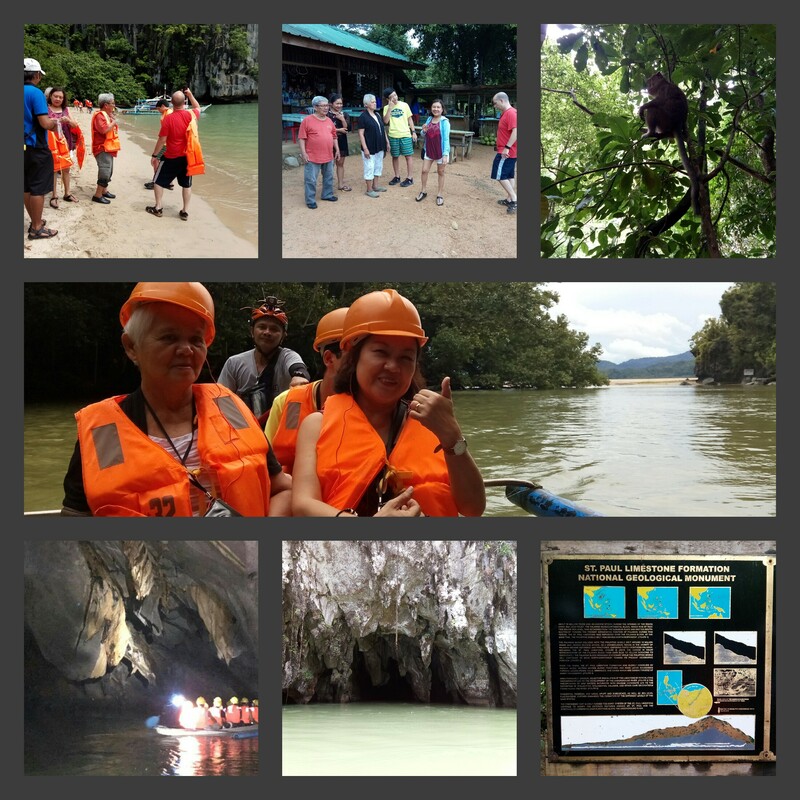 The tour is only a short segment of the Underground River. Special permits are required to enter the entire length of the cave. While the briefing on our way gave us some idea on what to expect, our senses were overwhelmed the moment we entered the cave. The Underground River is a spectacle and it is hypnotic. I find it also a blessing that my automated voice module didn’t work because all I heard were natural noises. 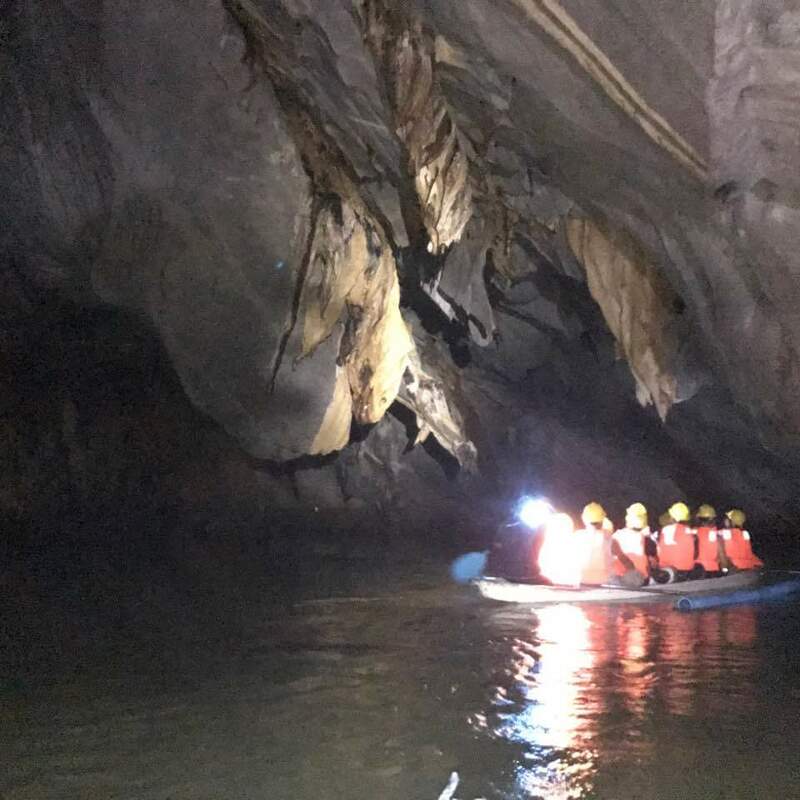 The rhythmic splash of the paddle, the echo of the boatman’s voice, the sounds of bats flying all over the cave, and the water dripping from the cracks above with some of it hitting our hard hats every now and then. Darkness during the entire trip cut only by the lights from our and other boatmen’s helmet added to the sense of mystery and awe. Then there’s that distinct stink of guano. All elements combined beat any movie visual and sound effects. 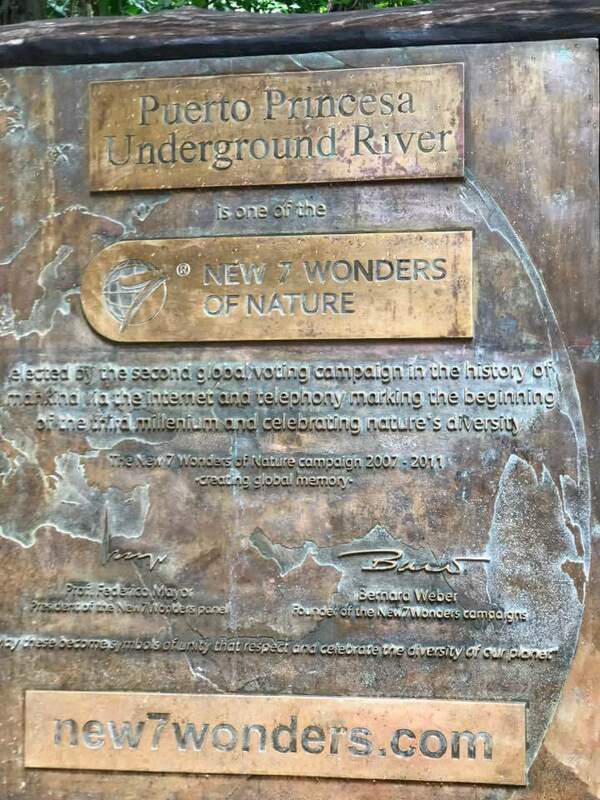 No question that the Underground River is among the seven natural wonders of the world. Nice beach but seems like they don’t allow swimming here as this is only for ferry boats. Part of the tour package is a buffet lunch at Gusto Grill and Resto where the highlight would be the chance to try their exotic offer, the Tamilok. I learned that this local delicacy is a mollusk rather than a worm which explains why despite its intimidating length and texture it actually tastes like oyster. My father and I had one serving each and we could’ve taken more. Too bad our American guest didn’t dare touch it. Our last dinner together at Munting Paraiso’s dining area. Sunday started just like the day before. Peaking out of our room’s native Zebra blinds reveals that we’re in for another soaky day. It’s a make or break day especially for wifey and Marcus who got left behind yesterday. I don’t want them to remember their Palawan vacation as just staying in the room and swimming in the pool so we braved the rains. Marcus was excited to do some driving adventure on our last day. We headed to MAX Palawan with anxiety if the rain would let up. With Marcus in mind, quitting was an option if rain continues to pour hard. Fortunately, luck was on our side and it was like heavens just readied our day’s playground. 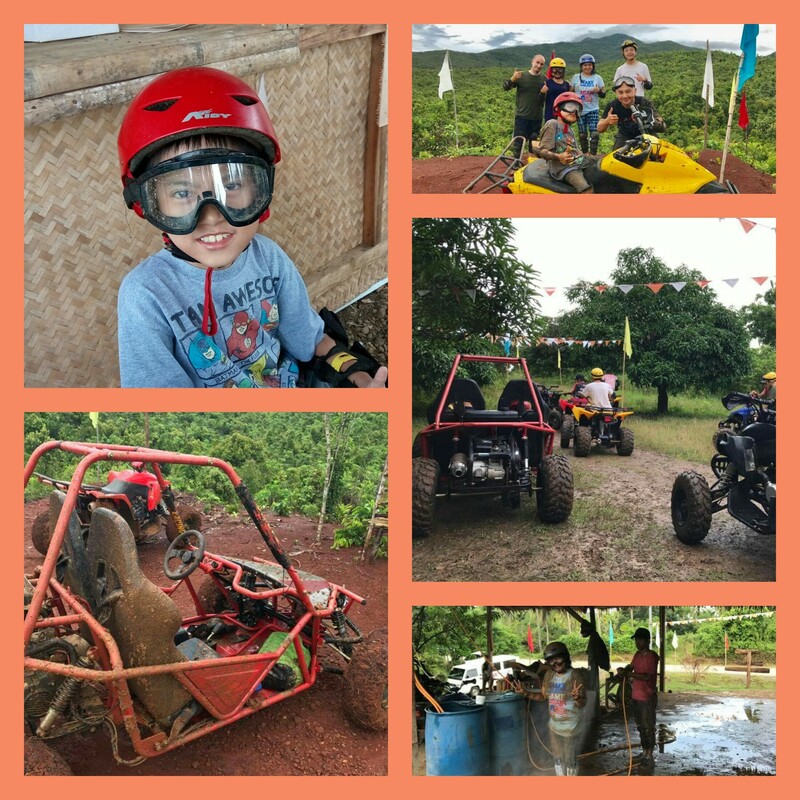 After few minutes spent putting on our safety gears and a quick orientation, we got ourselves strapped in the dune buggy. My sister partnered with my wife in the other car while my in-law and their son got on their respective ATVs. The track was rocky, twisting, undulating, and muddy. And we enjoyed it. It was wet and wild and exhilarating. 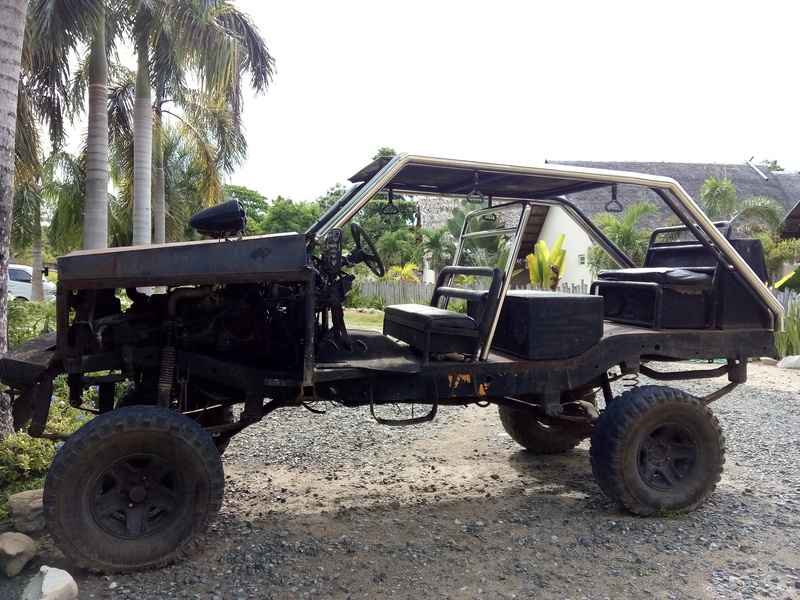 MAX Palawan’s dune buggy allowed me to drive with ‘controlled recklessness.’ Marcus enjoyed his role as navigator and never cared if mud and puddle water came splashing in. That’s my boy, willing to get dirty to save the day. We definitely didn’t regret picking this forty-five minute adventure over snorkeling or scuba diving. MAX Palawan is on Facebook , check them out. I wish they offered this. This a display at Blue Palawan Hotel where my in-law swiped his plastic bandit for our muddy adventure. We beat the clock on our way back to the hotel. Barely clean after a quick pressure hosing just to remove the clumps of dirt, we settled in MAX Palawan’s van with most of us still wearing our clay-stained clothes. Thanks to the preparation wifey did in the morning, we were able to accomplish the fastest check out we’ve ever done. We transferred to a cheap hotel as we wait for our flight to Manila. 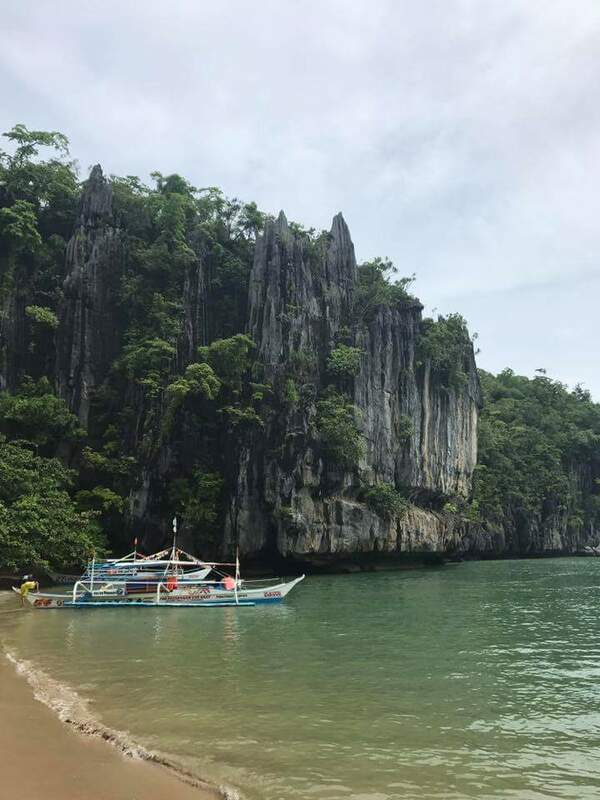 Our Palawan weekend was short and sweet. We didn’t really get to see the other popular attractions but the fact the we spent the weekend with family in a place we’ve visited for the very first time makes the experience irreplaceable. I also like that we were able to prove the advisories wrong. Philippines is still generally peaceful and its people and places could still create an experience that we could be proud of especially to our foreign guests. There will be a next time, we will be back. 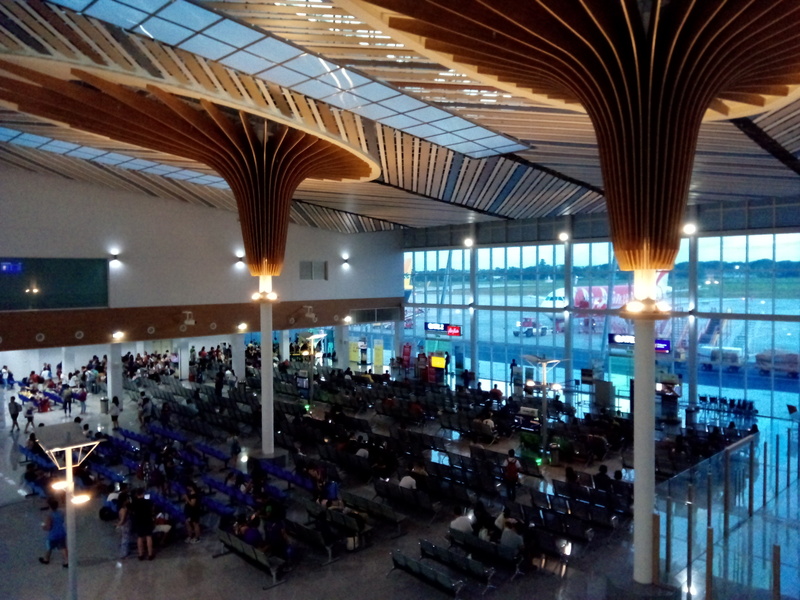 New Palawan Airport’s departure area. Munting Paraiso is good place for groups or individuals who prefer quiet accommodation as it has only less than 12 rooms and it is located 1-2 kilometers from the city proper. The way the streets going to the hotel are setup also made it appear farther. Their rooms’ interior and exterior designs are good and I think each of it has a veranda with a native hammock where one could lazily hang out while waiting for their next adventure. Lighting though is dim so reading books could be a challenge at night. We had a hard time assembling Marcus’ new Lego as we had to use cellphone lights to follow the instructions. I also learned later that my sis family’s room has a foul smell which my in-law said could be a backed up drain which prompted them to transfer to another hotel the day we parted ways. So it seems like it wasn’t me smelling guano when I entered our room’s restroom coming from the Underground River trip. My clogged nose that weekend was a blessing in disguise. 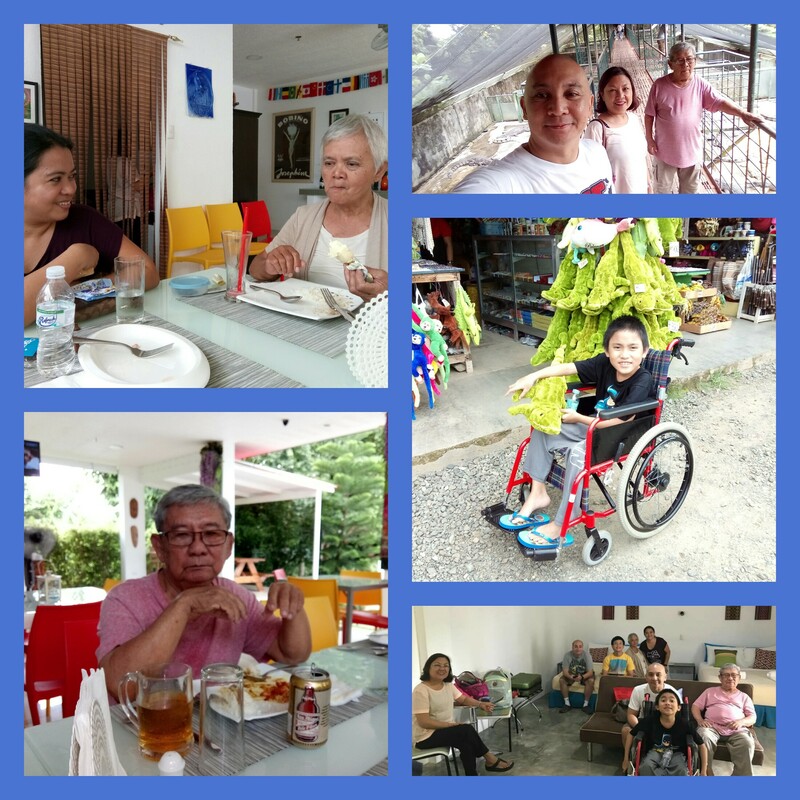 Trips are always a challenge with someone in a wheelchair. So strangers who offer help are always appreciated. One offered to carry my son’s wheelchair so we can see the bigger crocs at the crocodile farm’s elevated walkway but since I can still carry him I politely declined it. The tour guide also assured that they could accommodate Marcus and his wheelchair had we decided to bring him along. The wheelchair may be left somewhere at the finish area of the Underground River tour. 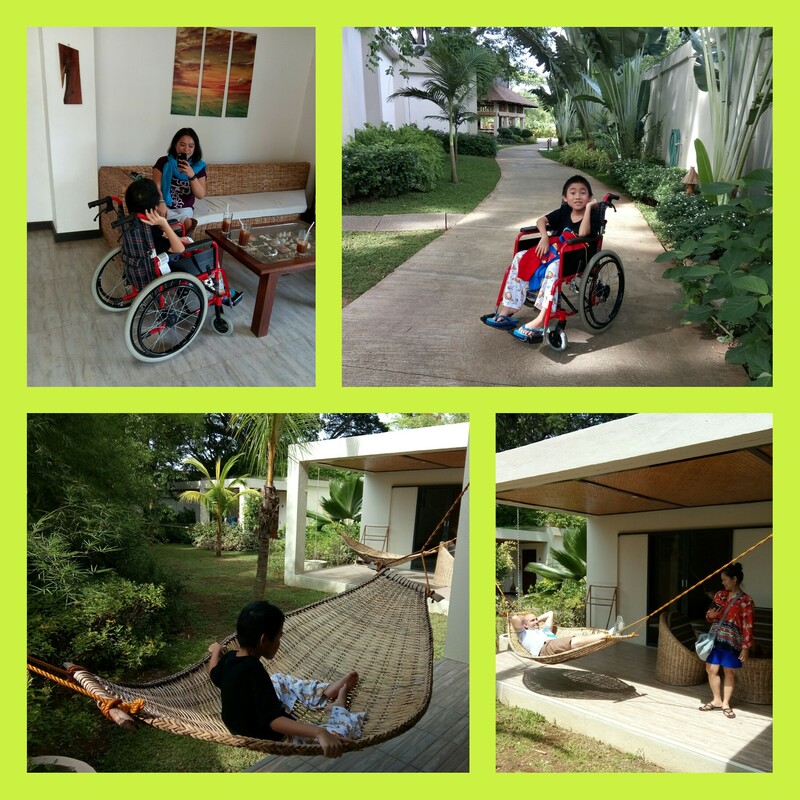 MAX Palawan was also PWD-friendly. They picked us up and the wheelchair fit just fine inside their van. The buggy’s four-point harness also ensured a safe ride for a 9-year old boy. I received a call from an unknown number while taking a siesta in D’ Lucky Garden Inn. It was from the airport clinic in Cebu. The caller advised that my mother got sick coming from Palawan and while waiting for their transfer flight to Bacolod. Good thing the doctor soon allowed her to be transferred to Mactan Doctors Hospital with my father in a wheelchair tagging along. I felt helpless that we can’t be there for them at that moment. My elder sister who got another airline eventually arrived there and took charge. They all missed their flights but were out of the hospital the next day with the doctor allowing my mother to fly back to Bacolod. Whew. Definitely a weekend to remember.